Given the time span represented here – as the title says, 25 years of rock ‘n’ roll - there’s an ongoing consistency to everything here. And that’s as it should be, of course. 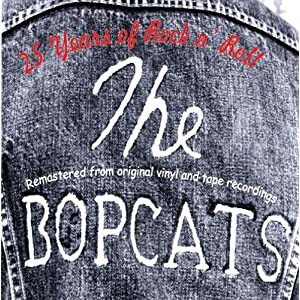 The Bopcats, part of the original rockabilly revival of the seventies, have been churning out their hard-driving mix of raucous blues and country-tinged, overheated blues and rock ‘n’ roll ever since. The sonics have been cleaned up as part of the re-mastering process – these recordings are culled from various sessions beginning in 1984 – but some were taken from demo-quality vinyl and tape recordings so there’s certainly nothing hi-fidelity about the collection. But a slightly muddy, somewhat grungy sound suits the material just fine – this is music with dirt all over it, and too clean a sound would only spoil things. The core band consists of brothers Lindy, Gary, and John Fralin, with (not surprisingly) various supporting players over the years. The band is tight but not slick, and arrangements are equally taut, with solos short and sweet and a big, fat beat aimed straight at the feet. Lindy Fralin provides most of the lead vocals, and while he’s more than adequate his delivery is a bit workmanlike at times, and there are hints here and there suggesting brother Gary has the gritter voice. Brothers Lindy and Gary contribute about half the songs between them, with covers including The Blasters’ “Marie Marie,” Johnny Cash’s ”Get Rhythm,” and New Orleans great Dave Bartholomew’s “Who Drank My Beer,” as well as a grinding, swampy take on the Rolling Stones’ “Ventilator Blues.” They’re all rather representative of the band’s style and sound, and the covers fit right in. The Bopcats have never been about stretching boundaries or re-defining artistic notions – they truly just want to play loud, fast, good-time rock ‘n’ roll, the kind that may not be ‘in’ style but never really goes out of style, either. It’s neither fancy nor pretty, but it’s unfailingly energetic and honest, and in the end, it’s a whole lot o’ fun.